The City of Spring Hill began in Fall 2016 the process of creating a Unified Development Code (UDC) through the updating of our Zoning Ordinance and Subdivision Regulations by hiring Camiros Ltd., a Chicago-based planning and zoning consultant, to oversee the project over the next year. Camiros created a community survey in December 2016 and collected input from community stakeholders who provided input on the strengths and weaknesses of the City's current zoning and subdivision rules and to identified needs that can be addressed through zoning. The feedback received will contribute to Camiros' technical report that will outline the elements that the City should consider for the Unified Development Code to meet our community's needs and expectations. 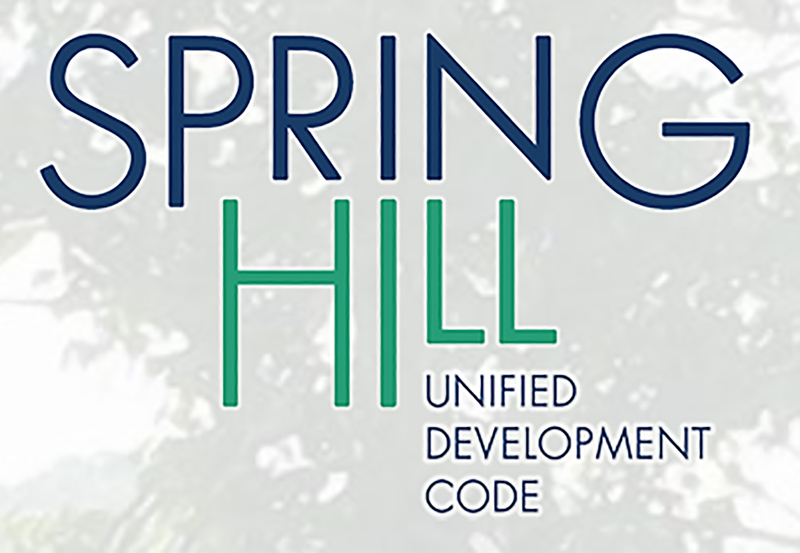 Creating a Unified Development Code is key to implementing the vision laid forth in “Spring Hill Rising: 2040,” our city’s Comprehensive Plan. The plan, adopted in 2015, provides mapped and written policy about how land should be managed and how development should occur. The Unified Development Code will take these policies as its base and provide a set of development regulations, generally organized by district, each containing specific regulations key to those policies. A zoning map identifies the location of these districts, specifying the development requirements affecting land within the City. Currently, the rules for development in Spring Hill are contained in a number of separate ordinances. A Unified Development Code (UDC) combines zoning and subdivision regulations, as well as other City land development ordinances, into a single code. The UDC will be the “rulebook” for land development and building within Spring Hill. The purpose of combining these and kindred ordinances is to assure consistency among development requirements, make it easier to develop land, and to make sure that the review and approval processes are as complete and efficient as possible. Our city’s first zoning ordinance was adopted in 1987. Spring Hill’s development is far more sophisticated and diverse today, and our zoning and development rules should reflect that. Creating a UDC will help us to better preserve and protect the City's historic development patterns while creating new opportunities for economic development, helping to make Spring Hill a more resilient, livable and business-friendly community. In August 2018, the Spring Hill Board of Mayor and Aldermen (BOMA) approved the new UDC, nearly two years in the making.